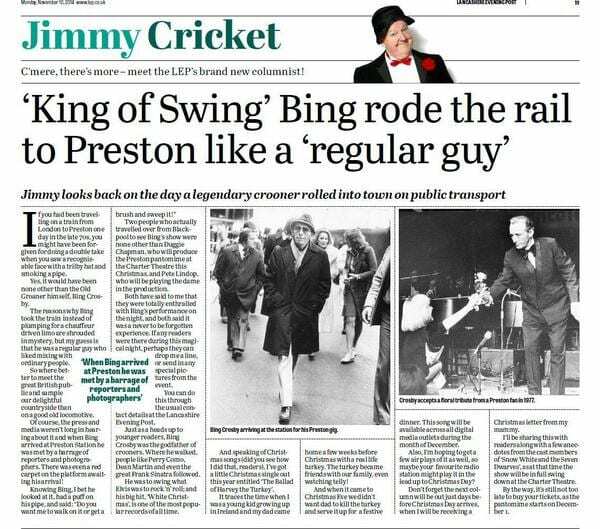 The late American singer and actor Bing Crosby is the subject of Jimmy Cricket’s latest column in the Preston-based Lancashire Evening Post. Well-known entertainer Jimmy recalls when Crosby, “none other than the Old Groaner himself”, used public transport instead of a limousine when he appeared in a show in Preston in the late 1970s. Crosby’s trademark bass-baritone voice made him one of the best-selling recording artists of the 20th century, with more than half a billion records in circulation – including probably his best known, White Christmas. “The reasons why Bing took the train instead of plumping for a chauffeur-driven limo are shrouded in mystery, but my guess is that he was a regular guy who liked mixing with ordinary people,” says Jimmy. Northern Irish comedian Jimmy is headlining Snow White and the Seven Dwarfs at the Charter Theatre in Preston – where he made his pantomime debut in 1981 – over the Christmas and New Year period. 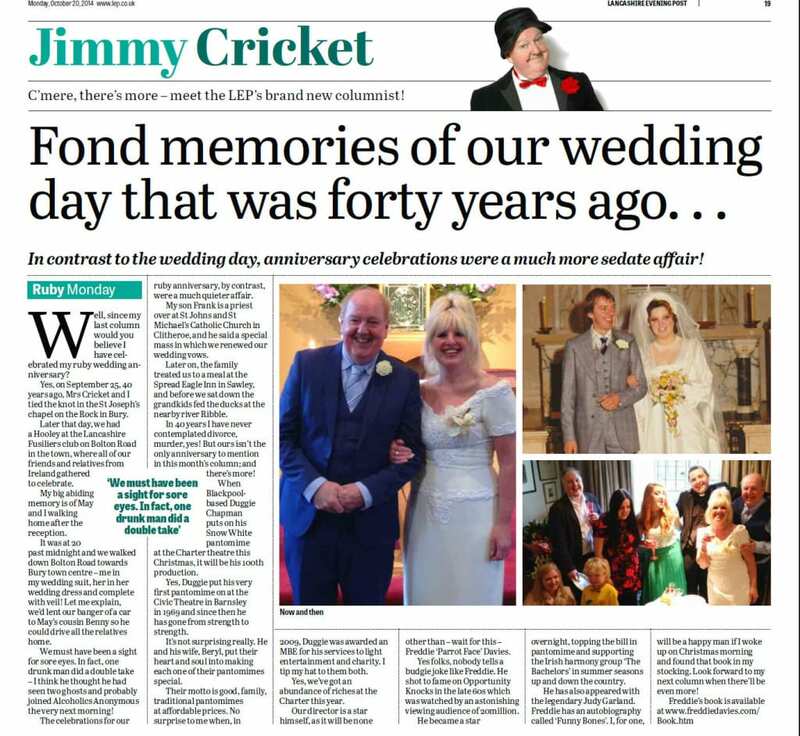 Jimmy Cricket relived his wedding day 40 years on in his latest column for the Preston-based Lancashire Evening Post. The famous entertainer is headlining Snow White and the Seven Dwarfs at the Charter Theatre in Preston – where he made his pantomime debut in 1981 – over the Christmas and New Year period. 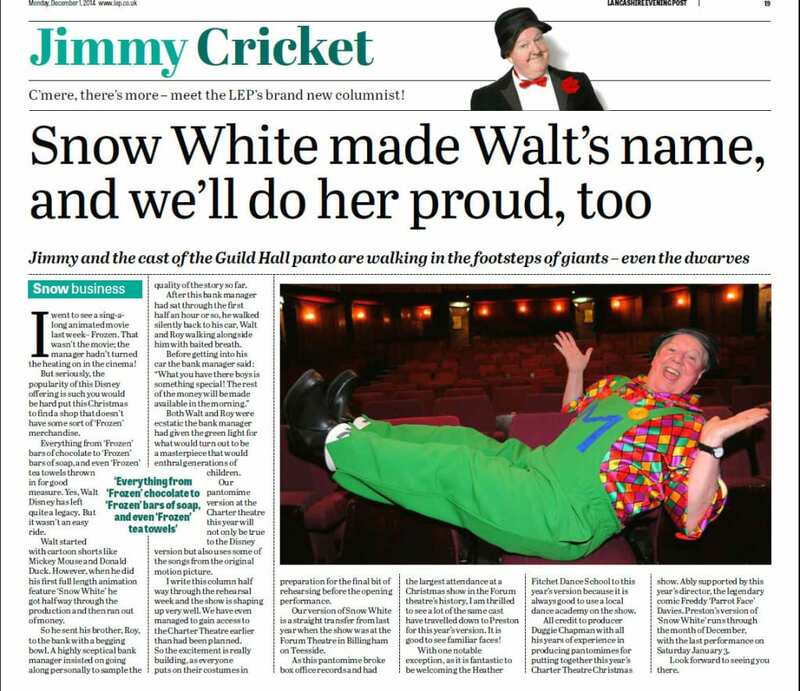 When the Lancashire Evening Post contacted Jimmy through his website editor Martin Hamer – former digital editor at the LEP – about the idea of a monthly feature in the run-up to the panto, he thought it was a “very flattering request”. And his most recent column recalls the happy memories from 1974 – and how he celebrated his ruby anniversary. Jimmy also talks about the pantomime, which will be directed by Freddie ‘Parrot Face’ Davies who found fame in the 1960s on Opportunity Knocks when it was watched by an astonishing 20 million people. “Nobody tells a budgie joke like Freddie,” laughs Jimmy in his column.